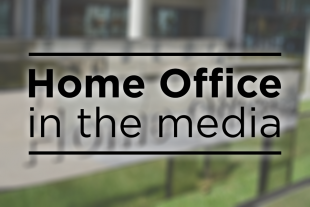 Today’s Home Office media stories include the Home Affairs Select Committee’s report on stalking and domestic abuse; child refugees and comments by the former Met Chief, Lord Bernard Hogan-Howe who has called on a review of whether cannabis should be reviewed. There is widespread coverage in the papers and on the Today programme of calls by the Home Affairs Select Committee (HASC) on the Government to make stalkers and perpetrators of domestic abuse sign a register. The HASC says that the register should be introduced as a “matter of urgency”. Under the proposals, perpetrators would have to register with the police within 72 hours of conviction or caution and notify them if they intend to move or travel abroad. The HASC’s chair, Yvette Cooper, was interviewed on the Today programme. She called for national ringfenced funding for refuges. Domestic abuse is a devastating crime that shatters the lives of victims and families. We are determined to transform our response so we welcome the Committee’s support for the Government’s planned Domestic Abuse Bill. The landmark Bill will create stronger powers to protect and support victims and survivors, pursue perpetrators and ensure agencies are able to respond effectively. It is right that the Bill, and the new Domestic Abuse Commissioner, focus solely on supporting the near two million victims and working towards tackling this crime. This Government has launched a £18.8 million fund this summer to help survivors rebuild their lives. Since 2016, we have also spent £20 million to creating over 2,200 bed spaces in refuges, supporting more than 19,000 victims. Earlier this year, we confirmed that refuge places will continue to be part-funded through housing benefit and we are committed to delivering a sustainable funding model to support these services across the country. The Independent claims child refugees who were refused “sanctuary” in Britain when the Calais jungle camp was demolished are being exploited in the UK after crossing the Channel alone. The piece claims that hundreds of unaccompanied minors who were living in the “shantytown” were denied legal passage by the Home Office in October 2016, with no right to appeal the decision. It highlights that the Court of Appeal recently ruled in two separate cases that this process was unlawful, stating that children were given “patently inadequate” reasons for the rejection of their applications. The Government remains steadfast in our commitment under the Dubs amendment to relocate 480 children to the UK from Europe as well as reuniting unaccompanied children with close family members under the Dublin Regulation. More than 220 children have already been transferred to the UK. Last year the UK provided protection to almost 6,000 children and also issued 5,218 family reunion visas, of which more than half were for children. The Sandhurst Treaty, signed between the UK and France in January 2018, includes a number of measures to strengthen our cooperation on unaccompanied asylum seeking children such as shorter timescales for acceptances and transfers under Dublin, and a £3.6m development fund to identify projects to support eligible children through the Dublin process. There is further coverage of comments by the former Met Chief Bernard Hogan-Howe who has called on the Government to set up a two-year review into legalising cannabis. The Independent and Telegraph report on the comments made by Lord Hogan-Howe after he visited Colorado – where cannabis has been legal for 14 years – for a Channel 4 Dispatches documentary. His comments were reported over the weekend by various newspapers. He claimed in his comments that there was a “general acceptance” that the policy was a success. The Government has no plans to decriminalise recreational cannabis. The decriminalisation of cannabis would not eliminate the crime committed by the illicit trade, nor would it address the harms associated with drug dependence and the misery they can cause to families and society. Decriminalisation or legalisation would send the wrong message to the vast majority of people who do not take drugs, especially young and vulnerable people, with the potential grave risk of increased misuse of drugs.